RICM is very excited to collaborate with TOJ Design Studio, Ocean State Printers and Donahue Models & Talent for our Annual Makers Event this June! If you value craftsmanship, pride in the details, be part of a community of makers and join us for an evening of inspiration! We will have 18 engaging Maker booths filled with our local craftsmen and artisans, local food vendors serving you their specialities, mixologists available at two cash bars, sounds of our unique local musicians, and 4 mini fashion shows to showcase our local fashion scene accented with beauty and innovation that will leave you inspired! It is all about celebrating our creative community, meeting and learning about our amazing makers of RI and supporting their craft. This is a family friendly event for all to attend and have fun! FREE and open to the public. A donation of $5 at the door is appreciated for your continued support for RICM! Contact us if you are interested in participating as a Maker, Musician or Caterer. Applications are available below. If you are interested in Sponsorship opportunities of this event, please contact us by emailing kim@ksdesignsri.com or filling out our contact form. Application Deadline is April 8, 2015. • Each booth comes with a 4ft x 4ft table and 1-2 chairs. You may bring an additional table no larger than 2ft x 6ft. You can also build up on your existing table(s) with tiers to display. • Booth space with electricity is limited and available on a first come - first served basis. • All maker/vendor location requests will be considered on a first come - first serve basis and honored whenever possible. • You must provide your own easels, display fixtures, table cover, etc... NO TENTS, NO WALL ATTACHMENTS. • All makers/vendors must check-in between 3 - 4 p.m. Due to safety issues, arrivals after 5 p.m., may forfeit booth. • Booths must be completely set-up by 4:30 p.m. All maker/vendor booths must remain open until 10 p.m.
• Break-down will be from 10 - 11 p.m. All makers/vendors must be off festival grounds by 11:30 p.m.
• The maker/vendor is responsible for leaving the area in the condition that it was originally received, i.e. removal of all debris such as boxes and trash. • This event occurs rain or shine! Be prepared for wind, rain and/or heat/cold. • All vendor fees are non-refundable. • If applicant is approved, maker/vendor will receive a confirmation email upon receipt of their application and will need to print and sign the agreement form and return with payment amount due. Payment and agreement form must be received by April 15th deadline in order to take part in this event. 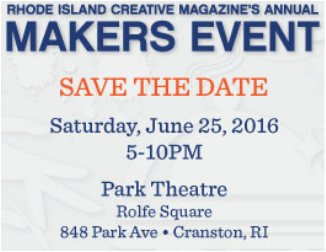 WAIVER: The Rhode Island Creative Magazine’s Annual Makers Event reserves the right to refuse any vendor application, should this occur the fee will be refunded. The Vendor shall defend, save and hold harmless the City of Cranston, Rhode Island Creative Magazine’s Annual Makers Event, their respective officers, agents, board members, staff, volunteers, sponsors and assigns from any claims, damages, losses, liability or expense which may arise, and shall not be held responsible for any loss or damage due to fire, accident, theft, weather, vandalism or any other loss or injury whatsoever or not specifically described herein, whether past, present or future. Booths are not insured by the City of Cranston, Rhode Island Creative Magazine’s Annual Makers Event or any sponsoring agents. Exhibitors must make provisions for safeguarding their goods. Exhibitor assumes full liability for protecting, care and maintenance of exhibitor’s property. ﻿If applicant is approved, a confirmation email will be sent with the agreement letter. Then the approved applicant will need to print and sign the agreement letter and return it with a non-refundable payment amount of $75. Payment and agreement form must be received by April 15th deadline in order to take part in this event. All checks are made out to: KS Designs, LLC.